This is the inaugural issue of a newsletter reporting recent articles published in IEEE Transactions on Nuclear Science (T-NS). We hope that you will find it a useful tool to help you identify new content of interest in the journal. The top section may highlight articles that the editorial team has identified as likely to be of broad interest to the community. These will be made open access (no subscription required to read the full article), typically for a limited time. Following those articles is the Table of Contents for the current issue of the journal. 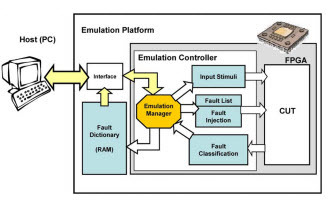 The highlighted links will take you directly to the article in IEEE Xplore. The August issue of T-NS described here contains a special part consisting of papers which review and/or extend the state-of-the art in modeling and simulation of radiation effects on microelectronics. The featured articles are all drawn from this special issue, and because of their expected broad appeal, have been made open access on a permanent basis. Feel free to forward this email to colleagues who you think may find it beneficial; they can subscribe using the link at the bottom. If you would prefer not to receive these emails, there is also an unsubscribe link at the bottom. "Physical Processes and Applications of the Monte Carlo Radiative Energy Deposition (MRED) Code"
"1/f Noise and Defects in Microelectronic Materials and Devices"
"Validation Techniques for Fault Emulation of SRAM-based FPGAs"
"Compact Modeling of Total Ionizing Dose and Aging Effects in MOS Technologies"
List of Reviewers . . . . . . . . . . . . . . . . . . . . . . . . . . . . . . . . . . . . . . . . . . . . . . . . . . . . . . . . . . . . . . . . . . . . . . . . . . . . . . . . . . . . . . . . . . . . . . . . . . .
Simulation of Laser-Based Two-Photon Absorption Induced Charge Carrier Generation in Silicon . . . . . . . . . . . . . . . . . . . . . . . . . . . . . . . . . . . . Limitations of LET in Predicting the Radiation Response of Advanced Devices . . . . . . . . . . . . . . . . . . . . . . . . . . . . . . . . . . . . . . . . . . . . . . . . . . . . Circuit Simulation Based Validation of Flip-Flop Robustness to Multiple Node Charge Collection . . . . . . . . . . . . . . . . . . . . . . . . . . . . . . . . . . . .
Geometry-Aware Single-Event Enabled Compact Models for Sub-50 nm Partially Depleted Silicon-on-Insulator Technologies . . . . . . . . . . . . Single Event Latch-Up Hardening Using TCAD Simulations in 130 nm and 65 nm Embedded SRAM in Flash-Based FPGAs . . . . . . . . . . . .
Automatic Single Event Effects Sensitivity Analysis of a 13-Bit Successive Approximation ADC . . . . . . . . . . . . . . . . . . . . . . . . . . . . . . . . . . . . . . . 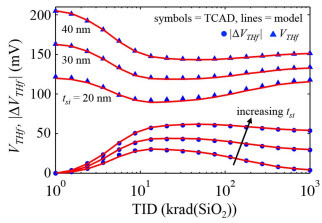 Improved Model for Increased Surface Recombination Current in Irradiated Bipolar Junction Transistors . . . . . . . . . . . . . . . . . . . . . . . . . . . . . . . Novel Bonner Sphere Spectrometer Response Functions Using MCNP6 . . . . . . . . . . . . . . . . . . . . . . . . . . . . . . . . . . . . . . . . . . . . . . . . . . . . . . . .
Collimator Design for a Brain SPECT/MRI Insert . . . . . . . . . . . . . . . . . . . . . . . . . . . . . . . . . . . . . . . . . . . . . . . . . . . . . . . . . . . . . . . . . . . . . . . . . . . . Effects of Regularisation Priors and Anatomical Partial Volume Correction on Dynamic PET Data . . . . . . . . . . . . . . . . . . . . . . . . . . . . . . . . . .
Quantification of the Conditioning Phase in Cooled Pixelated TlBr Detectors . . . . . . . . . . . . . . . . . . . . . . . . . . . . . . . . . . . . . . . . . . . . . . . . . . . . 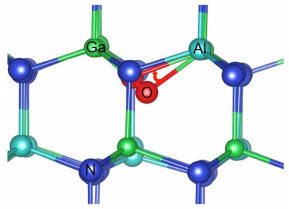 Solid State Organic X-Ray Detectors Based on Rubrene Single Crystals . . . . . . . . . . . . . . . . . . . . . . . . . . . . . . . . . . . . . . . . . . . . . . . . . . . . . . . . . .
Investigation of Geant4 Simulation of Electron Backscattering . . . . . . . . . . . . . . . . . . . . . . . . . . . . . . . . . . . . . . . . . . . . . . . . . . . . . . . . . . . . . . .
Effect of Non-Alignment/Alignment of Attenuation Map Without/With Emission Motion Correction in Cardiac SPECT/CT . . . . . . . . . . . . . . . . . .
A Novel Markov Random Field-Based Clustering Algorithm to Detect High-Z ObjectsWith Cosmic Rays . . . . . . . . . . . . . . . . . . . . . . . . . . . .
Adaptive Fading Memory H∞ Filter Design for Compensation of Delayed Components in Self Powered Flux Detectors . . . . . . . . . . . . . . . . . . . Methodology for the Determination of the Photon Detection Efficiency of Large-Area Multi-Pixel Photon Counters . . . . . . . . . . . . . . . . . . . . . 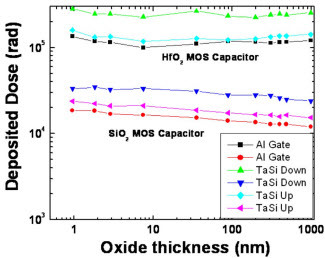 Radiation Induced Response of Ba0.5Sr0.5TiO3 Based Tunable Capacitors Under Gamma Irradiation . . . . . . . . . . . . . . . . . . . . . . . . . . . . . . . .
X-Ray Transmission Characteristic Measurements of Polycapillary Optics Installed in an Analytical Electron Microscope . . . . . . . . . . . . . . . . .